Before I start I have to admit that I’m not a huge fan of dairy products. When I use milk my skin gets dry patches and when I eat butter it literally makes my skin crawl. I’m not lactose intolerant but the less I have it the better. Which is why I generally avoid dairy. So why am I writing about yogurt? Because it is a lot different from regular dairy products. And it’s really, really good for you. Now to avoid any confusion I am not taking about “regular” yogurt. The kind with tons of sugar, fruit flavours, chocolate flavours, added colours, frozen yogurt or the ones with crunchy “bits” that you sprinkle on top. No, the type of yogurt I’m talking about is real yogurt. Natural, plain, “live” yogurt. What Makes Natural Live Yogurt Different? Yogurt is a fermented food and fermented foods are among the healthiest types of foods you can eat. All yogurt is made with “live cultures” which feed on the lactose (milk sugar) present in milk giving yogurt it’s distinctive taste and texture. The difference between “regular” yogurt and “live” yogurt is the presence of these cultures when they make it to the stores. Live cultures in regular yogurt are killed off with high heat to extend shelf life. Live yogurt on the other hand still contains live and active cultures (or probiotics) when you buy them. This is the key difference, and it makes all the difference. A healthy gut is probably not the first thing that comes to mind when you think of being healthy and looking good, but it’s actually one of the most important elements for optimum health. Even more surprisingly, good health and good looks are all about our immune system and the balance of bacteria involved. We want more “good” bacteria and less “bad”, so how do we get it? Yep, yogurt. Probiotics are the “good” bacteria we need to help balance out the “bad” bacteria present in our digestive system. When we have an unhealthy diet, are under stress or have taken a course of antibiotics the “bad” bacteria can get out of control and cause all kinds of health problems. While it isn’t possible to completely get rid of all the “bad” bacteria, we can help to control it by taking in the “good” bacteria through our food. 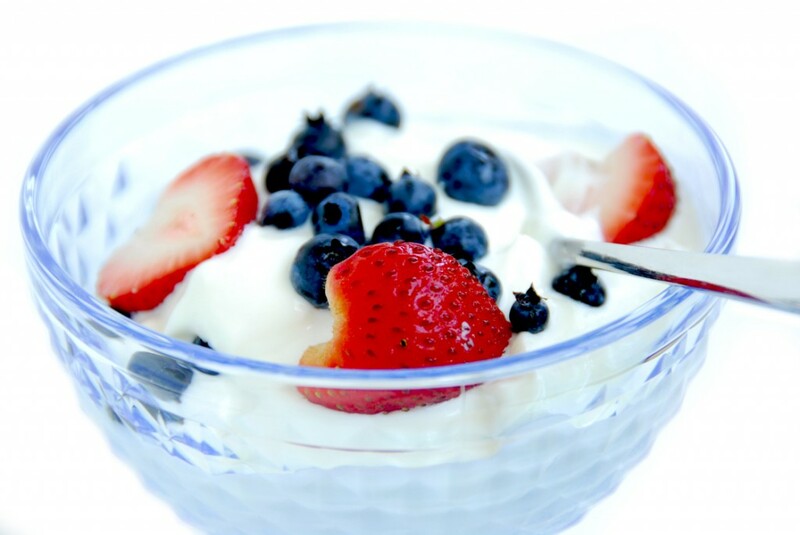 Natural live yogurt is one of the best food sources of probiotics you can find. What Type Of Yogurt Should You Look For? Make sure you read the label the next time you are buying yogurt. The less ingredients the better. Ideally it should just contain milk and live cultures. Some yogurts will say “made with live cultures” but as I said above all yogurt is made with live cultures, it’s whether or not they are still active that counts. The ingredients need to say “contains live cultures” or “contains live, probiotic cultures”. The specific cultures should also be listed, some brands may contain two others four. Look for Lactobacillus acidophilus, Bifidobacterium longum, Streptococcus thermophillus and Lactobacillus bulgaricus. “Old MacDonnell’s Farm” is the brand I use as it contains all of the above live cultures. The bulgaricus strain isn’t contained in a lot of other brands of live yogurts, possibly because it has a sharp taste. But it is one of the most beneficial probiotics you can take so it’s worth looking for. Try adding some fresh berries, dried goji berries, a little agave and/or cinnamon if you don’t like the taste. It’s also great in salads as a healthy alternative to mayo. Most natural live yogurts are available in low-fat and no-fat versions, you may also find whole or full-fat versions too. Many people still think all fat is bad and should be avoided, which just isn’t the case. We need a certain amount of dietary fat to be healthy, for our bodies to work properly and to help us absorb nutrients, and that includes saturated fat. We just need to make sure the fat comes from healthy natural sources and to use it in moderation. The brand of yogurt I use is low-fat which is the only version they sell, which is fine because there is at least some fat. Most people eat too many processed carbohydrates and not enough quality protein, which makes sense because processed foods are convenient and readily available. But these foods eventually lead to weight gain and the lack of quality protein causes the face and body to look soft and doughy. Finding convenient good quality protein sources to have as a quick snack when you get hungry or when you’re on the run can be difficult, but natural live yogurt is an excellent option. Not only will you be getting all the health benefits of probiotics, but the added protein will help you build muscle and burn fat as protein makes you feel more satisfied and less likely to over eat. So hopefully you will give natural live yogurt a try, or if you already eat regular “yogurt” you will make the switch to real yogurt and start getting the many benefits. Also, make sure to “like” the Facebook Page below to keep up to date with advanced tips on health and fitness, recipes, home workout videos and much more! 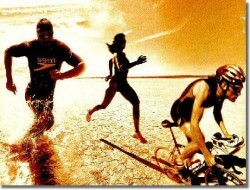 This entry was posted on March 13, 2011 at 12:53 pm. You can follow any responses to this entry through the RSS 2.0 feed. Both comments and pings are currently closed. 18 Responses to "Natural Live Yogurt – Lean Body Secret"
I used to think plain yogurt was too bitter when I first tried it as a kid, mostly because my taste buds where “blown” from all the sugar and salt in my diet at the time. I actually like the taste now. You could try adding some fresh fruit or use it as a dip for carrots, celery, peppers etc. 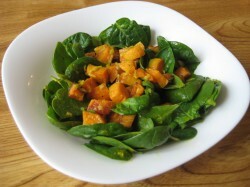 You could try mixing it with lots of chopped garlic, mint and cucumber and eating it as a dip or with homemade curries. Or blend it into a smoothie with some fruit. It sort of comes into its own in Summer or in hot countries, cos it’s so cooling in hot weather. Nice analysis of yogurt. I’ve never been a huge fan but I’m thinking it might be time to give it another shot, especially since I’m avoiding sugar. I think if I mix in some strawberries or blueberries that it might work for me. Thanks for the tips! You’re right about yogurt’s cooling effect. I actually remember reading that drinking water refreshes the taste buds making the heating effect from very spicey dishes, like curries or chilies, worse. Whereas yogurt cools the “heat” by coating the tongue, minimizing the “fiery” effect. I’ve tried it and it works. Excellent tip! I used to eat the sugary type when I was a kid and then stopped eating for years. I only started eating yogurt again, the natural live kind, around Christmas to build up my “good” bacteria after an antibiotic (which wipes out all bacteria, good and bad). I knew it was good but found out just how good once I started reading up on it. Hiya David , I’m great thanks. Just finishing off reflexology with your lovely sister, and working with Aimee! Glad everything is going well with you Carla I didn’t know you were working with Aimee, that’s great!!! I learned more than I ever thought I would about live yogurt from reading this post. The only time I currently eat yogurt is when it’s blended into my protein shakes and I currently use the FiberOne brand (probably one of “regular, sugary” kinds) but I may switch over to live yogurt since the taste probably won’t be all that bad when mixed in with fruit and other ingredients I include in my shakes. Natural live yogurt really doesn’t taste bad at all. It’s a little sharp initially, particularly if you are used to the sweetened ones. I actually really like the taste. But mixing it with other ingredients will definitely help ease you into the switch. You’re right, I’d say you won’t even notice it in your smoothie. About a year ago I gave up dairy, and ditched the yogurt as well. Unfortunatly I think my gut health has suffered a bit. Since I am not a huge fan of supplements (just Omega 3 and VIt D) I was hesitant to use a probiotic supplement. After reading this I will pick up some yogurt on my next trip to the grocery store. Thanks for the informative post. Nice post David. Do you have links to any nutritional information on this yogurt? Thanks! I don’t know if you would be able to get either of those brands where you are. But you may be able to get Fage, which has much higher protein but not sure if it contains active cultures as they don’t sell it here. Oh wow, I used to be so addicted to this stuff. Its gorgeous with fruit added, blueberries were my favourite and highly recommended. I have to say that the full fat version definitely tastes better and I believe the fat helps absorption of vitamins and minerals within too. You’re right, eating fat does helps you to absorb vitamins and minerals better. I’ve been adding extra virgin olive oil to my green veggies (cooked and raw) for that very reason. Great point. Great post, just wondering what is the other Irish brand you get?? The two Irish brands I would use are Glenisk organic yogurt (natural unflavoured) and Old McDonald’s Farm. I actually prefer the Glenisk brand as they contain all the beneficial active and probiotic cultures mentioned above but taste better than the Old McDonald’s brand. I like Glenisk’s natural whole organic yogurt or the natural low fat organic one. The fat content in the whole version is still quite low, so it’s your choice. I would limit my consumption to about 100g per day.